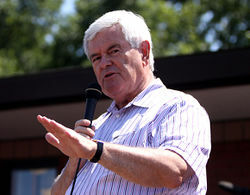 Gingrich asks America why they no take him seriously. For those without comedic tastes, the so-called experts at Wikipedia have an article about Newt Gingrich. 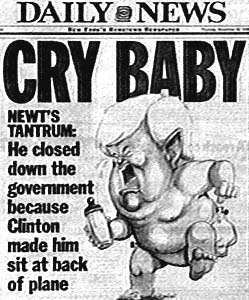 Newton Leroy "Newt" Gingrich (born June 17, 1943) is an American politician, author, and political consultant. He was a presidential nomination candidate on Earth and self-appointed leader of one of the first human civilizations on the Moon. Planted on a farm in Georgia, Gingrich was not originally meant to achieve big things, but thanks to his amazing resolve, he managed to sprout legs and walk away from his old life. His literal roots allowed him to easily snag a job as a botany professor, but he eventually got tired of teaching students things they would never use in life and desired something more. 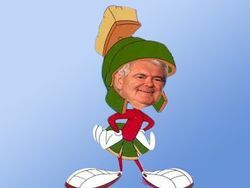 Gingrich made it quite clear that he didn't need anybody. 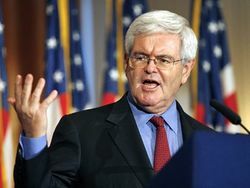 Newt planned to wear an outfit that befitted both his personality and larger-than-usual head. The moon after Newt's infestation conquest of it. This page was last edited on 17 January 2016, at 01:59.